Sunday morning I awoke to the magical words “I think I want to make slow cooker BBQ beef short ribs for dinner”. As I wiped the drool from my mouth, thanking my lucky stars my response was that sounds amazing! Being Sunday it was market day, so we stopped by our favourite butcher at South Melbourne markets who was kind enough to cut them especially for us. These slow-cooked BBQ beef short ribs are falling-off-the-bone tender and are surprisingly easy to make. Start by preparing your sauce straight in the slow-cooker to save on washing up. To ensure you seal in the flavour and increase the chance of caramelisation, simply season your ribs first with salt and pepper and brown them off quickly in a hot fry pan with a little olive oil. Place the ribs in the slow cooker and cover them in the beautiful sticky sauce. Let the slow cooker work it’s magic for the next 8 hours on a low temperature. 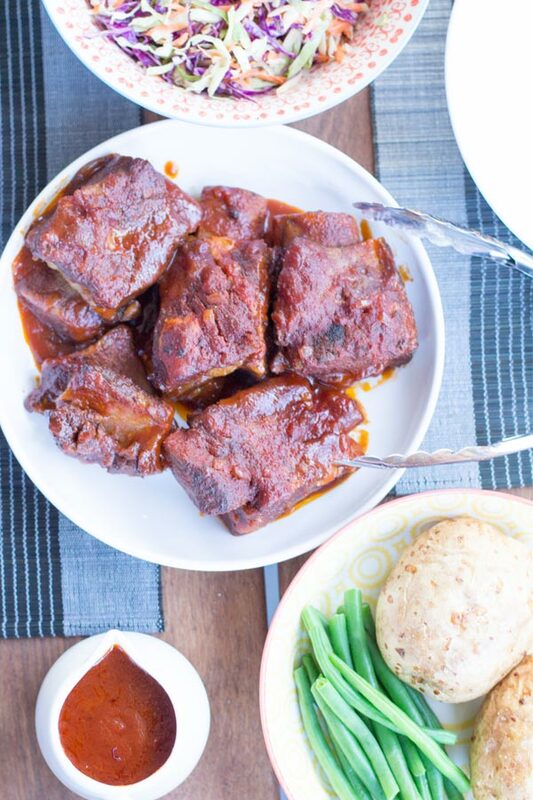 Brooke chose to serve these Slow Cooker BBQ Beef Short Ribs with baked potatoes, green beans, and coleslaw. It was the perfect Sunday night dinner! Sticky and delicious, these beef short ribs are a real showstopper and will fill your house with a delicious aroma. It’s also one of those recipes that will mellow and taste even better the next day if you are lucky enough to have any left that is. 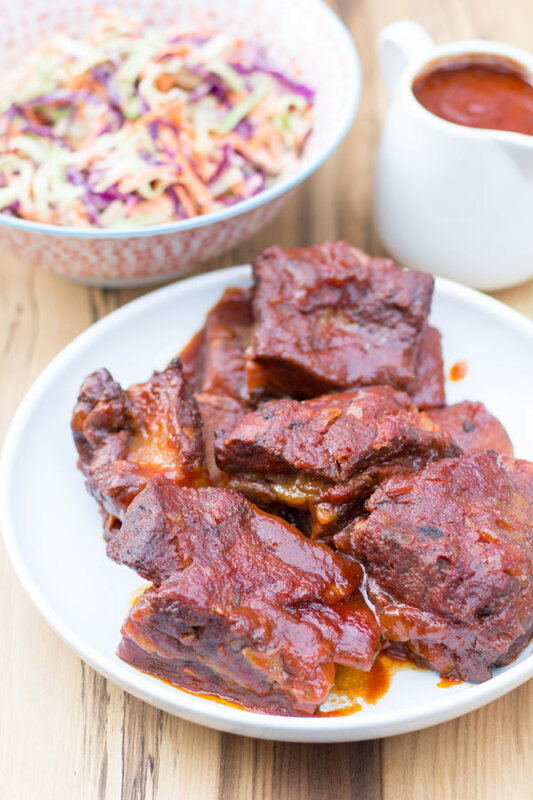 If pork is your meat of choice then check out our recipe for Asian BBQ Pork Ribs instead. 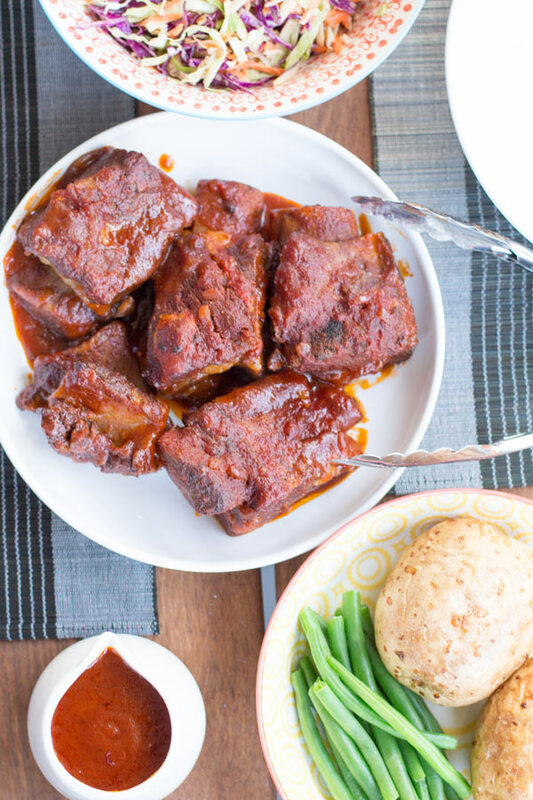 Slow cooker BBQ beef short ribs which are falling-off-the-bone tender and are surprising easy to make. Season the ribs with salt and pepper and brown off the meat in a lightly oiled fry pan. Mix ketchup, tomato paste, vinegar, brown sugar, water, diced onion and salt in a slow cooker, stirring to dissolve brown sugar and salt. 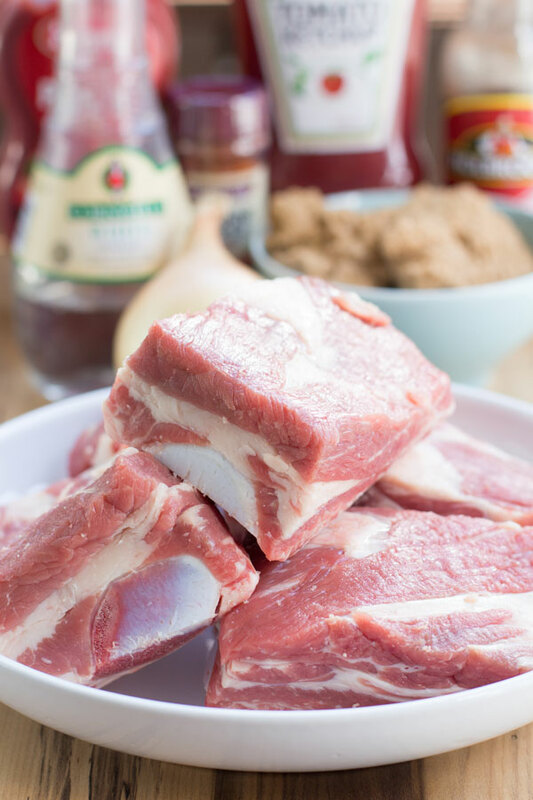 Place short ribs into the sauce and stir to coat. Set cooker onto Low, cover, and cook for 8 hours.